This cycling holiday is a 7nights and 8 days break based in Provence in France. It includes 7 breakfasts and 5 Dinners. 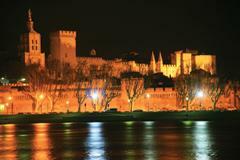 It starts at Avignon and has stops at the villages of Fontvieille and L'Isle sur la Sorgue. The cycling is classed as Moderate and each daily stage will be no more than 62km max. This is generally undertaken on quiet roads, where there are flattish sections following river valleys, rolling sections and some longish hills in order to reach the hill villages. Bike hire is available at 75 Euros and price includes a Euro currency supplement surcharge of £38.01. (£9.13 on single supplement). All accomodation is 2* Logis de France standard and night 1 is spent in the heart of Avignon in a comfortable town hotel, from which all the major sites are an easy walk away. The next 3 nights are spent in the village of Fontvieille, which is an attractive rustic logis with a small pool and terrace garden. A really peaceful place to spend your evenings. The last 3 nights are spent in the village of L'Isle sur la Sorgue, where the hotel is a modern, beautifully situated along the Sorgue river and bordered with chestnut trees. It is a very peaceful, location and has a roof top pool and serves home made jams at breakfast.